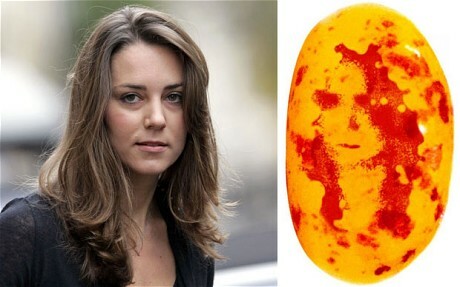 First, it was Jesus on a toast… now, it’s Kate Middleton on a jellybean!! I am not kidding! A couple enjoying a jar of jelly beans said they found a speckled jelly bean that looks like it has Kate Middleton’s face on it. “As [my girlfriend] opened the jar, I saw her immediately. She was literally lying there staring back at me. Given that the royal wedding is only a few weeks away, we hope to make a few pounds out of it by selling it on the internet to a collector,” said 25 year-old Wesley Hosie. Of course they do!!! Hosie and his girlfriend plan to sell the bean on eBay for 500 pounds (about $800). Check out other everyday objects that look like celebrities!